In celebration of Hulu’s highly anticipated new series Castle Rock, which premieres its first three episodes on Wednesday, July 25th, The Losers’ Club is bringing the expansive world of Stephen King to Chicago’s Music Box Theatre. From Friday, July 27th to Saturday, July 28th, the co-hosts of the popular Consequence of Sound podcast will curate a selection of films that will take audiences into the strange small town that King has been building for decades. In addition to screenings, the two-day event will also include a live podcast recording, themed drinks, giveaways, and vendors. Purchase two-day passes now and consult the full slate of films below — we’ve even added episodes for each. An adaptation of King’s Different Seasons novella, “The Body”, this coming-of-age flick follows four teens at the end of summer 1959 who leave Castle Rock to find the missing body of Ray Brower. It’s a teary adventure full of junkyard dogs, leeches, and Kiefer Sutherland. There’s something wrong with the most popular pooch in Castle Rock. Unfortunately, the only two people who know about it are a mother and child trapped in their broken-down car without food and water. Will they survive? Or will they be Cujo’s next meal? Everyone loves a creepy story. In this iconic anthology, the terrifying mind of Stephen King collides with the pulpy horror of EC Comics for five ghastly tales. You’ll laugh! You’ll cry! You’ll wonder how Leslie Nielson could ever be so mean! Who knew antiques could be so deadly? When a mysterious old man named Leland Gaunt sets up shop in the small town of Castle Rock, his customers soon discover everything their heart desires. Of course, each needful thing comes at a most needful price. A young, small-town school teacher wakes up from a five-year coma with psychic abilities: He can see the past and the future by the touch of his hand. As news of his “gift” spreads, he soon finds himself on a strange journey towards an unlikely evil. Life turns sour for a Midwestern family after they move to the rural college town of Ludlow, Maine. Thanks to their kooky old neighbor, they’re introduced to the dangerous powers of the Pet Sematary, where they learn that sometimes dead is better. No kidding. There’s something in the mist! Something deadly. Something unstoppable. Something out of this world. The good news is that everyone’s surrounded by delicious groceries. The bad news is they’re also stuck with each other and crazy begets crazy. Welcome to Shawshank State Penitentiary, where the laundry’s fresh, the warden’s corrupt, and the walls tend to be funny. First, you hate ’em, then you get used to ’em. After long enough, you get so you depend on ’em. Well, everyone but Andy Dufresne. Presented by the Consequence Podcast Network, The Losers’ Club is a weekly series dedicated to all things related to Stephen King. Each episode, the Losers gather together to read between the iconic pages and share the latest in King’s Dominion, whether it’s the author’s oft-controversial tweets, the boldest Hollywood headlines, or his endless forthcoming projects. In the past, special guests have included Thomas Jane, Mick Garris, Jerry O’Connell, Mary Lambert, Wil Wheaton, Tom Holland, and many, many more. 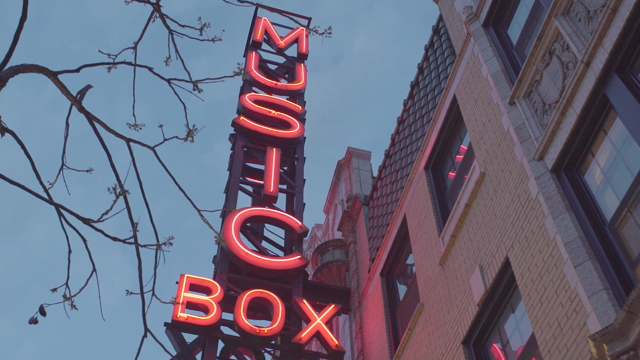 The Music Box is located blocks away from Chicago’s Wrigley Field, where it’s served as the go-to venue for independent, foreign, cult, and classic films for nearly 100 years. With 800 seats and an elaborate cocktail lounge, it’s the perfect destination for bonafide cinephiles.